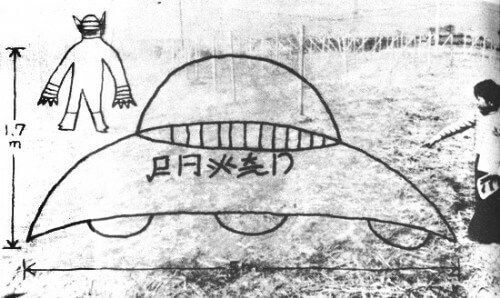 Young Japanese schoolchildren watched a UFO touch down on February 23, 1975. The landing took place near Kofu City, Yamanshi Prefecture, Japan. An occupant allegedly emerged and touched one child on the shoulder, temporarily paralyzing him. The occupant then walked around the craft and reboarded. The boys, in hysterics, ran home to their parents, who observed a large, orange-red light hovering over the vineyard. On the 24th, a sensation started in Yamashiro Elementary School in Kofu (the schoolmaster: Nobuyoshi Kaneko), when a UFO alledgedly landed and a spaceman tapped a pupil on the shoulder. This pupil drew a picture of the alledged spaceman and explained what had happened, and his teachers were shocked very much. Soon, the school authorities made an inspection of the place with tape measures and other tools. The pupils who saw the UFO were Masato Kawano (7 years old) and Katsuhiro Yamahata (7 years old) in the 2nd grade of the school. They say that first they found two flying objects glittering in orange color and crackling overhead at 7:00 pm on the 23rd, when they were rollerskating near the Hinode Housing Estate in Kamimachi, Kofu City. The bigger one flew away toward Mt. Atago, but the other went down between the props of the vineyard behind the Estate and landed on the earth. They approached over toward the object, which was about 5 meters in diameter and 2.5 meters high. Very scared they were about to return home, when the side hatch of the saucer opened up and an occupant came out of it. He was about 1.3 meters tall, with no visible eyes nor mouth, but with three fangs, and his body glowing in silver color. They saw another smaller humanoid in the saucer. The bigger humanoid walked away about a meter from the saucer with a long object somewhat like a rifle over his left shoulder, and put a hand on Yamahata’s shoulder. The boy was too scared to walk, so his friend carried him up on his back and ran away about 30 meters to his house. They reported the event to their mothers, went back there with them and found the glowing light again from a distance. The mothers say that the orange light kept glowing on and off for about 5 minutes in the vineyard, and then flew away while they turned their eyes away from it. The boys say the saucer had four illegible big letters on the hull of it. Meanwhile, Ichiro Minegishi, who is also in the 2nd grade of the school (8 years old), reported that he saw a shining object flying toward the Hinode Housing Estate 30 minutes before the boys found the UFO, At that time, he was going by a car with his parents and their friends on the Kofy Bypass through Masutsudocho, Kofu City, very near the Estate. It seems that when two concrete props were found almost fallen down next morning in the vineyard where the UFO had landed, the neighbors were alarmed again by the fact. It was very fine that particular evening around the Kofu district. The authorities of Civil Aviation Bureau of Transportation Ministry say that an airliner often flies over Kofu between 6:00 and 7:00 pm and that, especially, the lights of YS-ll propeller plane which flies at an altitude of thousand meters, will be visible to the naked eyes. When these two boys drew a picture of the humanoids and the saucer and put it up on the wall, all the pupils made a fuss about it. Two 7-year old boys saw a luminous orange aerial object approach, with a “ticking” sound, and land on 3 balls on a nearby vineyard. It was discoidal, 15 ft in diameter & 6 ft high. They approached it closely, finding that it was silver colored and had unknown words embossed on its surface. A ladder was extended to the ground, & a humanoid slightly over 4 ft tall disembarked. He wore silver colored clothing & carried something like a gun. His skin was dark brown & he had pointed ears, but his large head had no eyes, nose or mouth, merely wrinkles on the “face,” and 3 silver colored “fangs” 2″ long where the mouth should be. Both boys could see another, smaller humanoid in the cockpit, holding a control lever. The one who had emerged patted one of the witnesses twice on the shoulder, and uttered words “like a taper recorder running backwards.” Paralyzed by fright the witness sat down; but the other boy took him on his back and ran from the vineyard. They ran to one of the witness house & informed their parents, who could at first see the orange light pulsating in the vineyard; then it disappeared as they watched. 2 concrete posts were found displaced at the site.